Our first camp of the year, back in January, was in Waterpark Nagatoro. 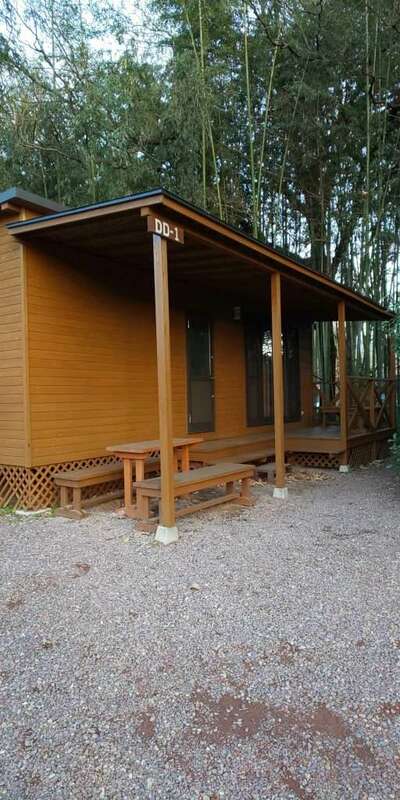 A delightful trailer and camping grounds with water activities in scenic Minano, on the border of Nagatoro, in Chichibu. We didn’t brave the extremes and actually stayed indoors. In a pleasing trailer house, a first for the kids. 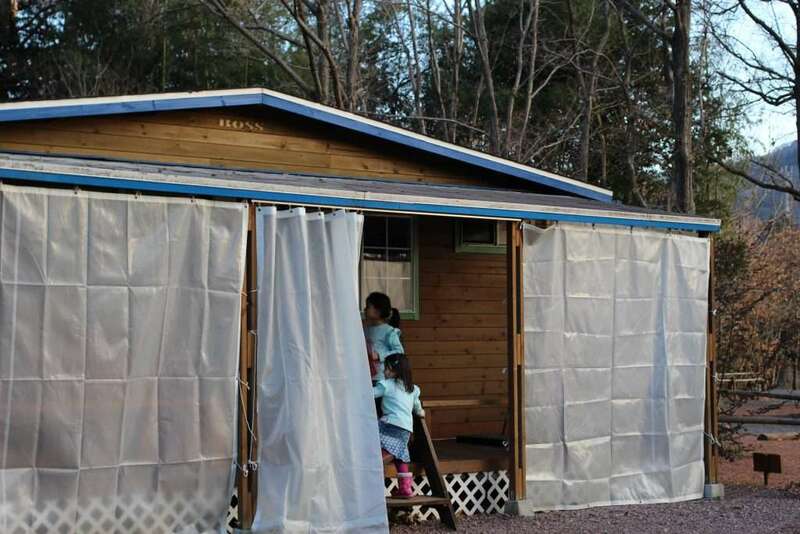 Mobile homes is most commonly used for this type of portable house back in Ireland. But this can be called nothing over than a trailer house for several reasons. 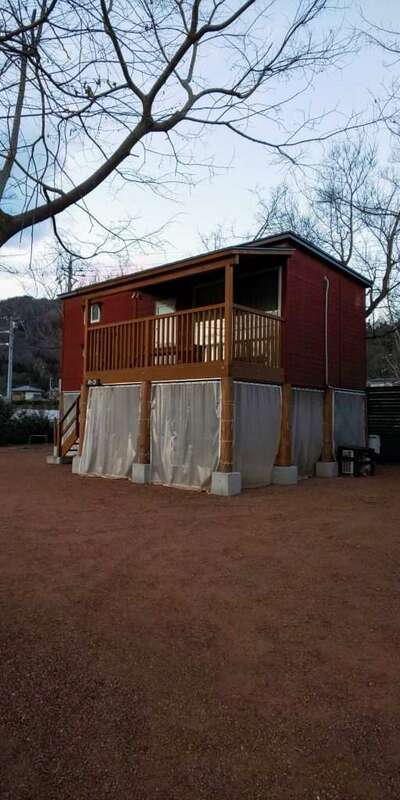 For one, it is a converted trailer rather than a purpose built mobile home. Secondly, it is just one open indoor space, no separate rooms like in a mobile home. And thirdly, it has no utilities apart from electricity. There is no running water: so no sink or toilet. We stayed in one of the wood trailers. 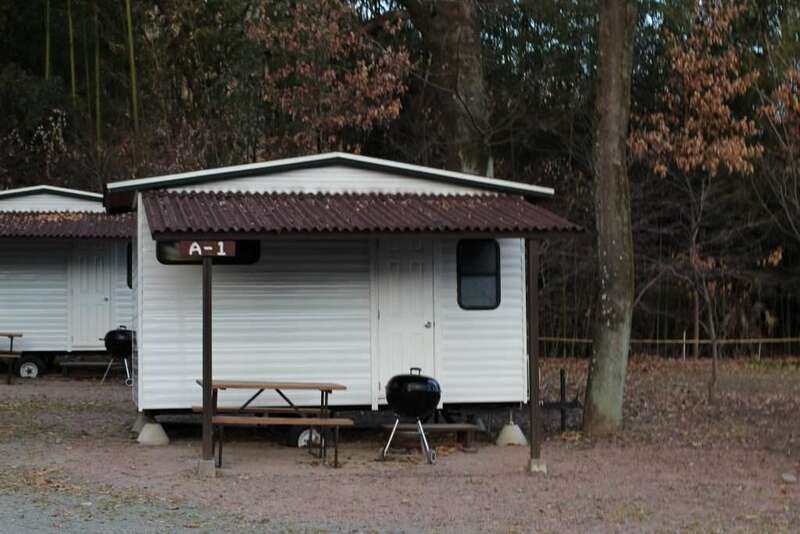 They have several different sizes and types in the campsite as well as a few cabins. Ours was the second largest type of trailer in the park to fit our bigger family. The smallest trailers are like tin caravans, really dinky and cute and amazingly fit upto 5 people. There are both tent sites and trailer sites that allow dogs. When we visited, shortly after New Years, there was nobody using the camping areas of the site. There are three main camping areas. One along the Arakawa and one past the trailer area, further inland. Then sites with more space and hammock hanging facilities. Each campsite is marked off from its neighbouring site. Most of the tent sites you are able to park your car beside the tent. The only thing I can fault about Waterpark Nagatoro is that there aren’t enough toilets. It was fine when we were there, because there were only three families sharing facilities. But I can imagine it’s chaos in summertime. In the trailer park there are only four toilets (2 men / 2 women) and eight showers (4 + 4) . Between at least a dozen trailers. There are other toilets and showers you can use, but they are a good walk away. Indoor dish washing area – washing up liquid and sponges provided. One tap has hot water. Nagatoro Waterpark and Nagatoro Autocamp are often confused due to their similar name, location and appearance. We have stayed in both. I would say, for anyone with small children Autocamp is probably better suited. They have facilities for babies such as a nursery with baby diaper changing. There is a fun reading room in an old train carriage. They also have cabins that were converted from train carriages. Their playground is nicer too. Waterpark probably suits older children a bit better with the choice of water activities. Waterpark is renowned for its river rafting. It is also a popular place for fishing. The cabins / trailers in Waterpark are nicer, cleaner and warmer in my personal experience. Both have a camping area as well as indoor options. Both have a river play area. Both are conveniently located within walking distance of a train station. And both are close to other attractions. The nearest station is Oyahana Station on the Chichibu Railway line. It is about a 15 minute walk to the campsite. By car it is about a 40 minute drive from the Hanazono Interchange of the Kanetsu expressway. hmmmm looks cold! lol. And lacking in giant water slides! Haha – yes, not that type of waterpark!! My phone was new and I couldn’t figure out the lighting – but I’ve no excuse for the camera – it was actually sunny but I guess the winterness won through!